To celebrate my new card blog I will be having a giveaway soon. I have three of Jayne Nestorenko's Cute Companion stamp plates to giveaway to one of my follower's. I will post the Candy post in a day or two so make sure you pop back to enter. Their first challenge is 'All that Glitters' and as I was just finishing this card I just had to enter. Her wings and the flower centre's have glitter on them. Battery has gone in my camera and the scanner did not want to scan this card properly as the base card is white so I had to put my A4 cutting mat behind it. Never mind it's finally scanned. I coloured the image with Copics and wanted to give the clothing a frabricy (is that a word LOL) look so once I had coloured it I covered the outfit with the blender pen and it does make a difference although it is not really noticeable in the scan and neither is the glitter : ( Lots of different Spellbinder dies, a Marianne die and some punches. Spring Bringer stamp from Wee Stamps. Sentiment stamp from Crafter's Companion Flower Fairy range. Spellbinders Grand Labels Twenty Three. Swirls from Marianne's Frames and Swirls set. 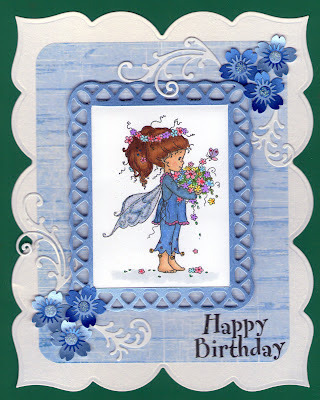 Hi Sue,your card is gorgeous!Fab image and colours and the shape is lovely...so unusual!Love those glittery wings, too!